Sneakers come in an endless variety of styles, designs, colors, from every brand name possible. Although there are so many styles and shapes, they still fall into certain categories, the main category being a high top or low top sneaker. Both the high top and low top sneaker have their own specific benefits, and each brings a certain style to the table. The High Top model and old fashioned 90’s style that never seems to lose its popularity, with the addition of a platform sole as an innovation and fashion trend. There is no compromise when it comes to ankle support. The high top sneaker is the leader of the pack when it comes to sneaker styles that offer protection against ankle strains, sprains, and injuries. The high top sneaker has the best design to reduce ankle inversion, thus providing you with optimal ankle support and stability. Many styles and models of sneakers and athletic shoes are designed towards a specific sport or purpose. In general, a sneaker is a more casual form of a shoe, which in some cases can be used for sports or training, although mostly it is for casual everyday wear. The ankle support that the high top sneaker provides is ideal for fast-paced sports where you accelerate quickly and turn sharply, such as Basketball. So, in turn, the high top sneaker has its benefits when it comes to sports and training. All in all a high top or low top sneaker is equally comfortable when it comes to the basic comfort features such as cushioning and foot support. However, the high top sneaker has the advantage to feel warmer in colder conditions than its low top counterpart. As most sneaker brands have become a style icon rather than a shoe for a specific sport or practice, the high top low top sneaker argument still exists. In comparison, the high top sneaker offers a specific style that is suitable with certain clothing and fashion options, whereas the low top will go with almost anything. In the end, it all depends on your personal style and comfort requirements. For the second half of the High Top platform Sneaker, the Platform sole, I want to point out some specific benefits. As the Platform sole is becoming more and more popular for aesthetic and fashion reasons, it is likewise gaining fame for its health benefits, as opposed to a high or flat heel, in other shoe types. The High Top Sneaker with Platform Sole is a High fashion element that can be worn with a variety of casual outfits. The platform sole will give you a bit of height and is brilliant to wear with very long skirts, dresses or pants. A thick platform sole absorbs plenty of shocks and reduces the impact on your feet and joints. The Thick Platform Sole likewise offers a bit of cushioning and much better support. You will also have much better balance and stability with this form of the sole. Durable and comfortable leather or canvas uppers in a variety of color options. A lace-up closure for a comfortable and snug fit. Thick and durable platform rubber outsole. When it comes to the casual and fashionable sneaker, the Converse All Star hands down is the most popular and versatile brand out there. Here I have the elevated sole high top, leather model, of the Chuck Taylor range. Pure and durable leather uppers. Decorative stitching and superb quality construction. A thick and durable rubber platform outsole. Inside there is an EVA insole for cushioned comfort. Inspired by the 90’s trend, and still a fashion icon of note. The Buganda Fashion sneakers just made the cut as a high top sneaker in my books, with a high platform outsole. These fashion sneakers are available in either a smooth leather black or white color option, or a perforated leather white with pink, blue or white interior. A durable anti-skid platform style rubber outsole. Light weight and very comfortable. Perforated breathable, or smooth leather upper construction for your preference. Vans is another well-known brand in fashion and skateboarding sneakers with some stunning designs. The SK8 platform high top sneaker features either pink or grey, suede leather uppers with black lace-up feature and black platform rubber sole. A durable platform Vulcanized rubber outsole with a patterned tread for super grip. Inside there is a textile lining to keep your feet warm and cozy. A padded footbed for underfoot cushioned comfort and support. The 3.5 cm platform offers exceptional stability and support. Skechers is another name in the sneaker industry that we are quite familiar with. They too have a stunning high top platform model, the Hi-Lite Sugar sneaker. Available in a grey, black, navy or off white color suede upper, with white laces, and a white outsole. A thick and durable rubber outsole. Manufactured from high-quality durable leather and rubber for the platform outsole. A padded insole for additional comfort. Classic streetwise look in a comfortable and supportive sneaker. 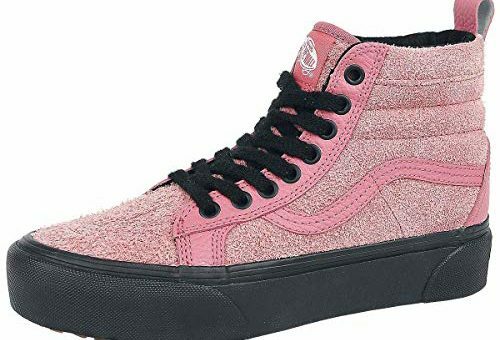 I found these beauties, they are the latest trend in high top platform fashion sneakers, with an almost Converse Canvas sneaker type style, and a platform sole with an elevated heel. Manufactured from pure cattle-Hyde and canvas materials that are super durable and lightweight. A lace-up closure system in white for the optimal fit. A thick and durable white outsole with a platform style. The uppers shades that are available are, black, blue, pink, white and red. A classic style that is highly fashionable, perfect for any occasion. Though quite difficult to come by in that sequence, the high top platform sneaker is a very fashionable and versatile sneaker, with some excellent comfort features. From my list you will see I have included some very well known and sought after brands, as well as a few newcomers just for that extra bit fashion and style.